It looks like a mixed bag of teams that are capable of taking the hardware on both the boys' and girls' side. Old Rochester, Oakmont Regional and Newburyport are some of the key teams for the boys. For the girls, Littleton, Ashland, Oakmont and possibly Austin Prep could be battling at the end. Newburyport's Jack Carleo, who finished fourth in the high school mile of the Millrose Games last week with a state best of 4:13. is entered in the mile and the 1,000-meter run. He has a best of 4:13.17 (US #9) for the eight-lapper and ranks among the top 20 in the nation in the 1,000 with his PB of 2:31.69. If he runs both, he has a chance for two meet record. His brother Nick Carleo, a 2014 grad and a sophomore at Providence College, has the mile record of 4:20.23. The potential is there for him to smash the meet mark in the 1K, which is 2:36.28 by Nick Costa of Carver in 2015. A meet record should also become extinct in the two mile where top-seed Brandon Hall of Hopedale has a best of 9:30.73, nearly 14 seconds under the meet mark. Hall 's time is also 20 seconds faster than his nearest competitor. Old Rochester will be relying on Danny Renwick to rack up some big points. He's the top seed in the 55m hurdles with a best of 7.74. Renwick is also the one to beat in the high jump where he has a best of 6-8, a height that ties for No. 14 nationally. How about the girls' long jump? The top seed is meet record-holder Alyssa Zee of Ashland, who established her mark with a 17-9 leap in 2016. She comes into Friday's meet with a best of 17-7. 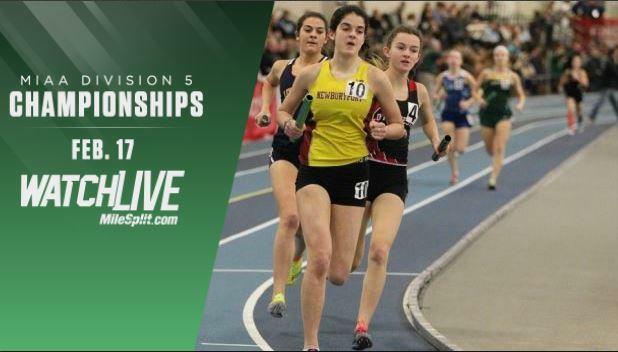 Two other leapers are also within striking distance of Zee's record - Juliette Nadeua of North Reading (17-6) and Olivia Smith of Martha's Vineyard (17-4.75). Littleton's Sarah Roffman is the clear-cut favorite in the mile where her best of 5:07.73 is 10 seconds ahead of the No. 2 seed. She'll also lend her footspeed to her team's top-ranked 4x800m squad, which has a seed time of 9:39.96.